A rough, whitish block recovered from an Elizabethan shipwreck may be a sunstone, the fabled crystal believed by some to have helped Vikings and other medieval seafarers navigate the high seas, researchers say. In a paper published earlier this week, a Franco-British group argued that the Alderney Crystal—a chunk of Icelandic calcite found amid a 16th century wreck at the bottom of the English Channel—worked as a kind of solar compass, allowing sailors to determine the position of the sun even when it was hidden by heavy cloud, masked by fog, or below the horizon. That's because of a property known as birefringence, which splits light beams in a way that can reveal the direction of their source with a high degree of accuracy. Vikings may not have grasped the physics behind the phenomenon, but that wouldn't present a problem. "You don't have to understand how it works," said Albert Le Floch, of the University in Rennes in western France. "Using it is basically easy." Vikings were expert navigators—using the sun, stars, mountains and even migratory whales to help guide them across the sea—but some have wondered at their ability to travel the long stretches of open water between Greenland, Iceland, and Newfoundland in modern-day Canada. 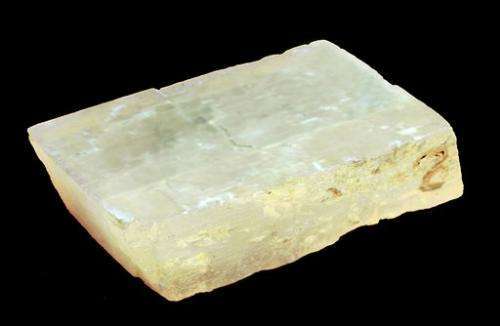 Le Floch is one of several who've suggested that calcite crystals were used as navigational aids for long summer days in which the sun might be hidden behind the clouds. He said the use of such crystals may have persisted into the 16th century, by which time magnetic compasses were widely used but often malfunctioned. Le Floch noted that one Icelandic legend—the Saga of St. Olaf—appears to refer to such a crystal when it says that Olaf used a "sunstone" to verify the position of the sun on a snowy day. But that's it. Few other medieval references to sunstones have been found, and no such crystals have ever been recovered from Viking tombs or ships. Until the Alderney Crystal was recovered in 2002, there had been little if any hard evidence to back the theory. Many specialists are still skeptical. Donna Heddle, the director of the Center for Nordic Studies at Scotland's University of the Highlands and Islands, described the solar compass hypothesis as speculative. "There's no solid evidence that that device was used by Norse navigators," she said Friday. "There's never been one found in a Viking boat. One cannot help but feel that if there were such things they would be found in graves." She acknowledged that the crystal came from Iceland and was found near a navigation tool, but said it might just as easily have been used as a magnifying device as a solar compass. Le Floch argued that one of the reasons why no stones have been found before is that calcite degrades quickly—it's vulnerable to acid, sea salts, and to heat. The Alderney Crystal was originally transparent, but the sea water had turned it a milky white. Le Floch's paper—written with Guy Ropars, Jacques Lucas, and a group of Britons from the Alderney Maritime Trust—appeared Wednesday in the Proceedings of the Royal Society A. Was St. Edmund killed by the Vikings in Essex? What inscription? Surely you must mean the one not mentioned anywhere in the stub of an article above?